This splendid Tuscan villa enjoys an enviable position amongst the Chianti Classico vineyards only 10 minutes from the town of Gaiole. Villa Monika’s history dates back to 1000 when it was originally built as a watchtower. Its hilltop position with beautiful vistas over the Alto Chianti and the castles of Tornano and Lecchi allowed its inhabitants expansive strategic views. 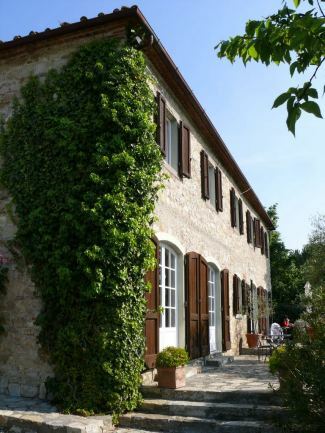 Over the course of the centuries, this independent stone house has been redesigned into a large villa measuring 450 sq. meters in size. Recently, the house was completely renovated in the classical Tuscan style with many details referring to the traditional Tuscan lifestyle. Furnishings are tasteful and comfortable and inside décor includes wood beamed ceilings, cotto floors and whitewashed tiles. Large east facing French doors were added onto the dining room and den to welcome the morning sun. These glass doors make the rooms very bright and connect the inside of the house with the garden in a wonderful concept of continuity. Villa Monika can comfortably accommodate 10 people with room for up to 11 people. It works particularly well for five couples given all five bedrooms have en suite connecting bathrooms. Four of the five bedrooms have mattresses that divide, thus providing more flexibility. All the bathrooms feature Carrara marble and all beds have orthopedic mattresses. Comfy robes and hairdryers are provided and bath towels are changed every twice a week. Daily maid service is included in the price. The bright den/TV room with its French doors offers a very welcoming ambiance. It features very comfortable couches, satellite television with DVD, CD player, piano and a computer with fast internet. The kitchen is fully equipped (two ovens, large refrigerator, 10 burner stove) for enthusiastic cooks and there is a large laundry room with washing machine and iron facilities. One of the fireplaces off the kitchen can be used for cooking. Villa Monika is set in 5000 sq meters of extensive grounds that are carefully maintained. The lighted swimming pool (6m x 12m) with deck and sun loungers is surrounded by a variety of shrubs, trees and colorful flowers typical of the region. Pool towels are provided. There are several furnished outdoor spaces, even a hammock, for relaxing and enjoying the peacefulness of the Chianti countryside. There is also an Italian bocce court and fishing pond. Guests will be delighted to also have at their disposal a separate covered loggia with sweeping views which is fully furnished as an external living/dining room with fireplace and outdoor kitchen and sink. The friendly owners include an arrival dinner in the rental fee. Ample parking on the grounds. Access to the property is 800 meters by a well maintained gravel road. Entrance by way of a stone courtyard through an arch into the entrance hall. To the left is a double bedroom with en suite bathroom with shower. This room is the smallest bedroom of the house – and the coolest due to its very characteristic stone walls. This room provides a good option for those preferring a ground floor bedroom and bathroom. Straight ahead from the entrance hall is the rustic breakfast/dining room with working fireplace. This can still be used for cooking and was the hearth of the house. To the left, through a small hallway is the fully equipped kitchen, which is cozy and functional at the same time. It features a gas range with 10 hobs, a gas oven, an electric oven, dishwasher, toaster, food processor, American coffee pot, and many other kitchen appliances to suit the most demanding cook. A large laundry room with washing machine, a second dishwasher and ironing facilities sits off of the kitchen. It also has a dryer and large refrigerator and freezer with ice cube and ice water dispenser. Back to the main entrance hall: To the right is a hall that leads to a lovely wooden staircase (17 steps). Here is a large bedroom suite, the only bedroom suite accessed by the interior staircase. Here is a double bedroom and a bathroom with both a bathtub and large shower. Back down the wooden staircase you enter either the formal dining room on one side or the den/TV room on the other. Both have large French windows opening onto a full-length terrace. The grounds and pool are beyond. First floor accessed by external staircase. Entrance is through a covered loggia. There are four double bedroom/bathroom suites. One enters into a small entrance hall and off of this hall, to the left, is a passage sitting room. Doors on the right and on the left of this passage room open onto two spacious double bedrooms with doors to their own en suite bathrooms with bathtubs with handheld shower head. Back to the small entrance hall off of the loggia. To the right, one enters into a living room with fireplace and single sofa bed. A double bedroom with complete en suite bathroom with bathtub with handheld shower head is accessed from this living room. EQUIPMENT: Satellite TV, DVD, CD player, telephone, 2 ovens, freezer, dishwasher, washing machine, hairdryers, computer with Internet. OUTDOORS: Garden and equipped outdoor areas, furnished covered loggia, swimming pool (6x12), car park, pizza oven, bocce court. SERVICES INCLUDED IN THE PRICE: Final cleaning, arrival dinner, bath linen changed twice per week, electricity, gas, water, pool towels, Internet, baby bed. ON REQUEST AND NOT INCLUDED IN THE PRICE: Maid service, cook. LOCATION: 5km Gaiole in Chianti (all kinds of shops and services), 14 km Radda in Chianti, 20 km Castellina in Chianti, 24 km Siena, 60 km Florence, 80 km Florence airport, 50 km Ugolino, 18 hole golf course. ACCESS: 800 m of dirt track road.